The Pros and Cons of this Bluefin Fitness 3D Vibration Plate. 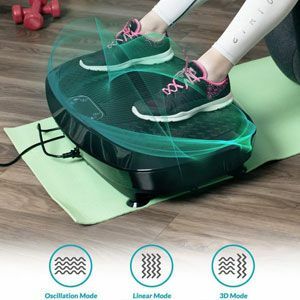 This Bluefin Fitness 3D Vibration Plate has a great motion and enough settings to help users keep up with their fitness goals. There are two important elements to the motion of this plate. There is a 3D motion that comes from two different plates. This modern technology is married with a vast range of 180 levels to help user progress with their workout plan. This motion, along with the additional programmes and workout cords, adds to the diversity of the system. As a result, many users can enjoy a great session each day and see their progress. Then there is the benefit of the ease of use. There are some great features in place here to help users get comfortable and find their rhythm with ease. The remote control means that users can set up their session without bending down to the control panel. The workout poster also helps them find the right poses and try new things. Then there is the bonus of the integrated Bluetooth speaker for some motivational music. The majority of buyers are happy with this Bluefin Fitness Vibroplate, but there are some small, occasional flaws. The first issue to watch out for here is a bit of a rarity. There are users that have bought this Bluefin Fitness vibration plate and found that the build and finish aren’t quite right. There is a rubber mat on the bottom to stop the machine from slipping, but this has peeled off in some cases. Then there is the mixed opinion over the noise produced by this machine. Some are happy enough considering the power of the machine, while others feel that it is far too noisy. So is this Bluefin 3D Motion Vibrating Plate still recommendable when we consider these small flaws? It is difficult to criticise this machine too much because there are so many positives and such a minority of critics. You could find that your machine is a little faulty and noisy, but it is more likely that it is effective and highly functional. There is a nice blend between the professional and at-home machine here. The ease of use and comfort features make it accessible, but the 3D motion and settings take it up a level in terms of its potential. 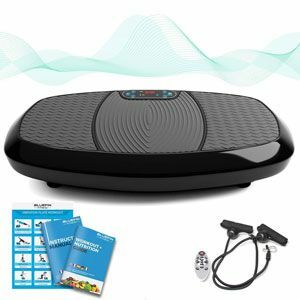 Therefore, it is definitely easy to recommend the Bluefin vibration plate to users that want a little more from their vibration plate. Find more reviews about the Bluefin Fitness 3D Vibration Plate on Amazon here.